Please tell me these pipe sections are not meant for an underground stream….. 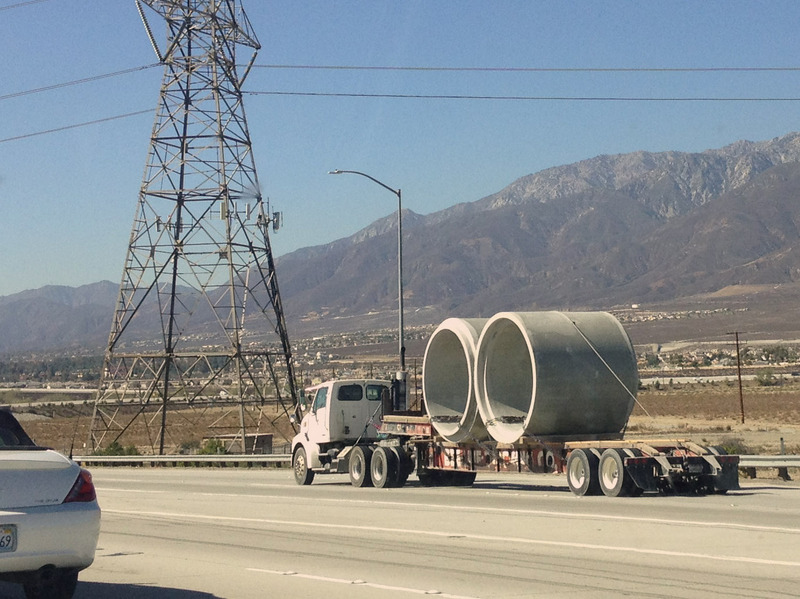 When I passed this truck on the 210 freeway this afternoon, I wondered what watershed these huge pipe sections were destined for. I thought about all the rain gardens, bioswales, wetlands, stream restorations, urban parks, and urban biodiversity that could be created if we had spent the $$$ used for the digging of trenches and laying of such massive pipes on something that actually benefited the everyday quality of life of urban residents, that replenished local groundwater supplies so we can reduce our dependence on imported water, while nurturing native riparian and wetland biota, while improving the quality of water in our bays, while providing non-electronic entertainment for all the kids that live in parts of the city that otherwise have no easy access to parks, while still providing flood control benefits. 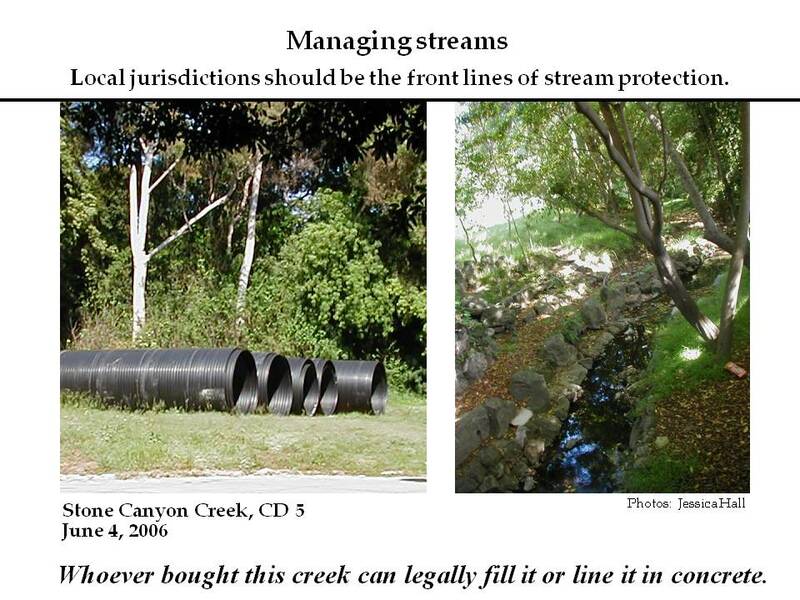 Tell me these pipes are meant for something other than to convey one of our urban underground streams toward the ocean in a way that prevents their use by native biota, and which prevents us nature-starved city people from experiencing the physiological and public health and microclimate benefits that urban greenery provides. Tell me that these pipes are being transported because urban streams all over are being daylighted, and that using bigger and bigger pipes to convey a precious resource like water toward the ocean is recognized as a quaint part of our historical past. Tell me underground pipes are being replaced by wetlands, infiltration zones, and streams, and that the reuse of pipe sections that used to convey urban streams is now choice material for architecture for the homeless, where the thick concrete walls of pipes are perfect as thermal mass that creates passive climate control… or that these pipes are being reused as wildlife crossings under freeways…. or that sci-arc students are making them into the new modular architecture? pod hotels? something…..
I’ve been spending some time with family down in Orange County… and I got a chance to explore Santiago Creek. I did this exploring mostly by bike. It was actually really great to get my mind off of things and just follow an urban creek upstream and down. I love to bike around on streets and anticipate where I might be able to access a creek next, looking for what sort of condition it’s in, how access, bicycling, reinforcement, humans, critters, vegetation, etc. all are working or not for the waterway. I did a great deal of this sort of exploration a lot in the late 1990s when I was first setting up the monthly Down By The River walks series for Friends of the L.A. River, and then quite a bit in 2005 when I was working on my book Down by the Los Angeles River. I recommend it highly – exploring creeks, I meant, not my book – though I recommend that too. Whether you’ve got a concrete channel or a natural creek in your neighborhood, explore it – see where it flows to (often a journey from urban to even more highly degraded and concreted… until you get to the ocean) and where it flows from (of ten a journey from concrete to natural foothills streams.) It can give one a sense of place… often it takes one to the older parts of a place – great historic neighborhoods and bridges, other depression-era public works… sometimes just a slice, a sort of transect, through neighborhoods, including great places and neglected ones. Santiago Creek is a tributary of the Santa Ana River. 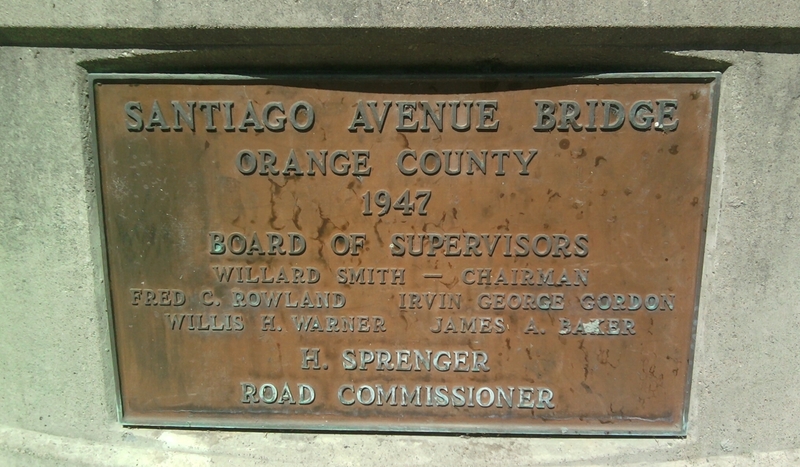 Santiago runs mostly through the cities of Santa Ana and Orange. I wrote about Santiago Creek briefly here, and ran Joel Robinson’s Santiago alert here. There’s also the Santiago Creek Greenway Alliance that’s working to protect the creek. I am going to write more extensively about my recent Santiago Creek explorations soon, but I thought I’d get something posted quickly about one feature I encountered. The new environmentally friendly Los Angeles Zoo parking lot was officially introduced on April 7th 2011 during an Earth Day weekend event. The project is a $13.9 million dollar stormwater enhancement with multiple types of best management practices constructed to help reduce runoff of polluted water during storm events. A few posts ago I mentioned the Rain Gardens being built on Ballona Creek. I am working with the contractor on the project, and so have been fortunate to observe the stages of implementation. We are still weeks away from completion. Cobble and sand deposits, Ballona Creek flood control right-of-way. 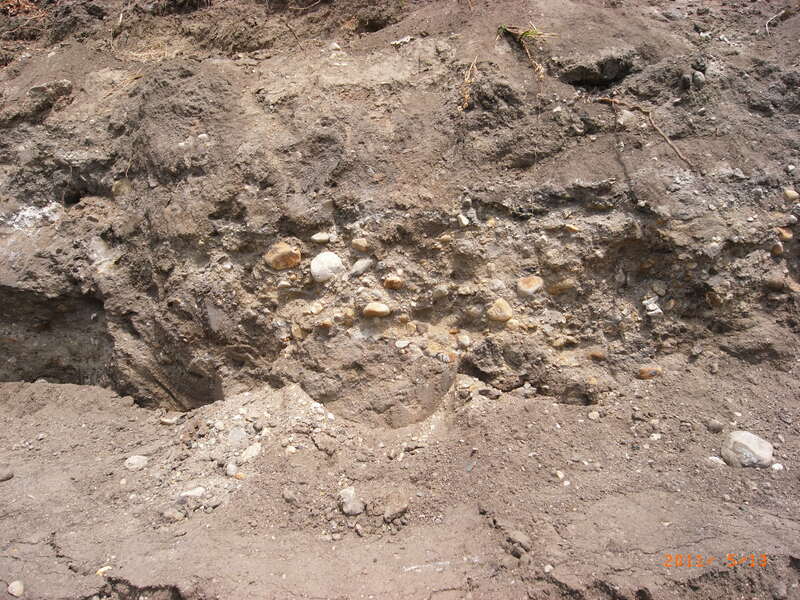 Several weeks ago I took a walk along an excavated area of the right of way. These excavations will be filled with a soil-compost mix in terraced bioswales. But the walk along this opened-up bank was oddly poignant, revealing layers of Ballona Creek that had itself been excavated and then piled up here. The sense of Ballona as a once-natural watercourse became more tangible seeing pockets of cobble and sand that must have been in the creek’s bed at one time, carried from the Hollywood Hills, tossed and gently moved over decades until deposited out of the channel to build up the flood control channel. It was as moving to me, imagining the life that once flourished here, and as haunting as visiting the ruins of Chaco Canyon or any archeological site. This bit of geology will be closed back up soon as walls are built up, filled and planted. But perhaps someday those cobbles will be free to roll down a restored river – when we’ve finally embraced our waterways as part of the urban fabric. 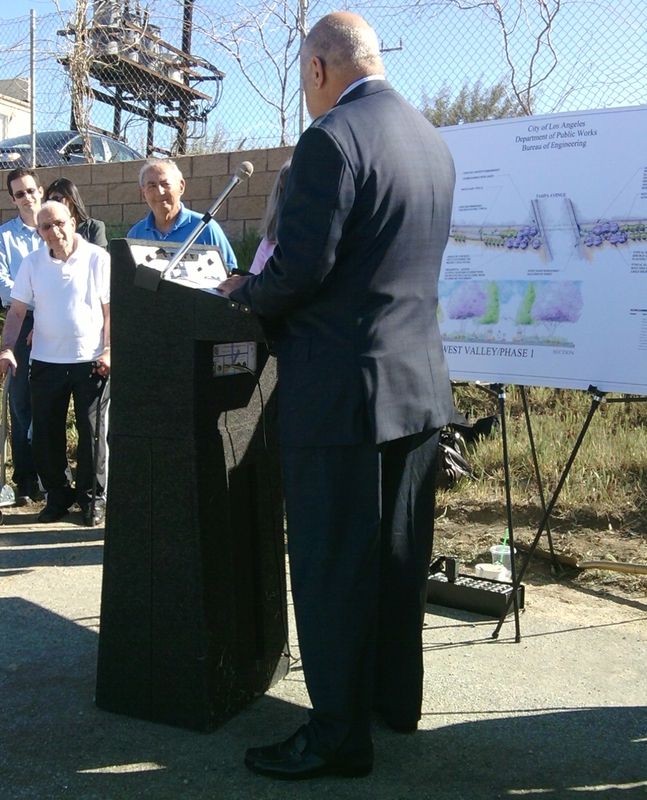 This afternoon, before an assembled crowd of about fifty, Los Angeles City Councilmember Dennis Zine presided over a groundbreaking ceremony for a new stretch of Los Angeles River greenway and bikeway. Construction has begun on the 2.2-mile segment of landscaped bike path, extending from the Vanalden Avenue footbridge to the end of Hartland Street, just upstream of the Mason Avenue Bridge. L.A. Creek Freak reported on this project earlier; for details check here for project background, here for art and design, and here for funding and phasing. Spotted yesterday: pre-striping markings on the Elysian Valley segment of the L.A. River bike path. They're three short white lines in the foreground of this photo. Bike path officially under construction since mid-2009 officially opens on December 4th - announcement below, more details soon. > At Spouting Off, Heal the Bay’s Mark Gold reports on promising regional water board votes and efforts to reduce trash in local waters. See also HtB’s Ban the Bag rally below. > Guess the animals and win a poster from L.A. Stormwater. Deadline is next Wednesday November 17th 2010. > Will Campell bikes the Arroyo Seco and shoots another great riders-eye-view video. > L.A. Times Greenspace looks into scary drinking water issues in California’s San Joaquin Valley. > Congratulations to The City Project’s Robert García on being awarded the American Public Health Association’s Presidential Citation! > Bike the Los Angeles River from Griffith Park to Long Beach this Sunday November 14th 2010, departing at 7:30am from the Autry Museum. Details at Biking in L.A.
> Heal the Bay invites you to a rally to Ban the Bag – at 8:30am on Tuesday November 16th 2010 supporting the L.A. County Board of Supervisors as they vote to ban plastic bags in county unincorporated areas. Check here for details. > On Thursday, November 18th 2010 at 7pm, the Arid Lands Institute at Woodbury University presents Morna Livingston speaking on Steps To Water: The Ancient Stepwells of India. It’s part of the lecture series: Excavating Innovation: The History and Future of Drylands Design. The free public talk takes place at Fletcher Jones Auditorium, Woodbury University, 7500 Glenoaks Boulevard, Burbank 91510. > On Saturday November 20th 2010 from 9am-1pm, the Elysian Valley Neighborhood Council, Council President Garcetti, and L.A. County Public Health host a free Health Fair. The event takes place at the Elysian Valley Recreation Center (1811 Ripple Street, L.A. 90039) and includes a free raffle for a new bicycle, courtesy of the Los Angeles County Bicycle Coalition. > The Santa Monica Bay Restoration Foundation is holding its monthly Ballona Wetlands Community Open House with tours Sunday November 21st from 9:30-1:00. Guided tours leave at 10am, 11am, and 12 noon. Meet at the Fiji Gateway, 1320 FIji Way in Marina del Rey 90292, across from Fisherman’s Village. > On Sundays November 28th and December 5th 2010, Jenny Price leads the All-Valley L.A. River Thai Noodles & Cuban Sweets Tour. It goes from the start of the L.A. River in Canoga Park to Griffith Park, and includes the Great Wall of Los Angeles mural on the walls of the Tujunga Wash. Tours go 8:30am-4pm, click here for info and to sign up. > At 12noon on Saturday December 4th 2010 the Elysian Valley portion of the L.A. River Bike Path will officially open. To emphasize the shared nature of the facility, it’s being called the L.A. River Pedestrian/Bike Path. Creek Freak will post more event information here soon!! 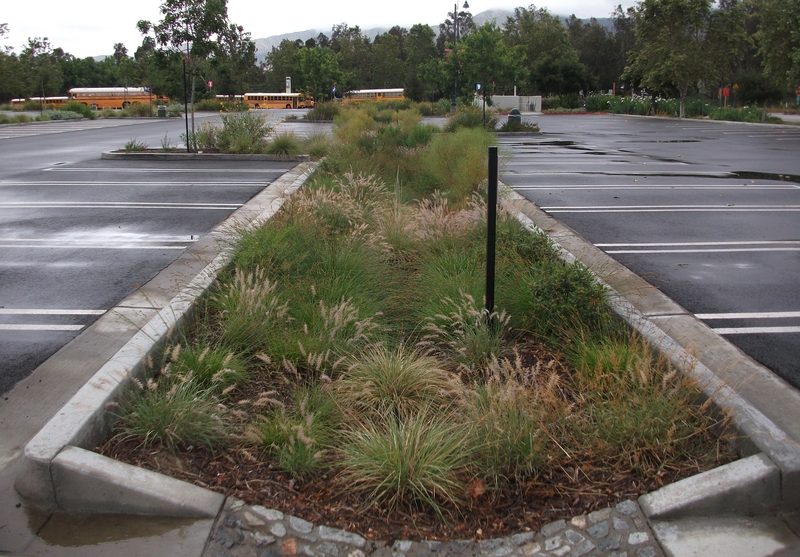 > Duarte dedicates its Encanto Park Bioswale and Outdoor Nature Classroom on Tuesday December 7th 2010 at 9am. Encanto Park is located at 751 Encanto Parkway, Duarte 91010. You are currently viewing the search results for swale.